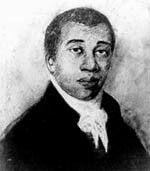 Richard Allen was born in Philadelphia on February 14, 1760, the slave of Benjamin Chew, a prominent lawyer and Chief Justice of the Commonwealth from 1774-1777. When he was a child, Richard, his parents and his three siblings were sold to Stokeley Sturgis, a Delaware planter whom Richard described as "unconverted...but... what the world called a good master." Despite his master's "tenderhearted[ness]," Richard longed to be free, "for slavery is a bitter pill, notwithstanding we had a good master." When Stokeley got into financial trouble, Richard's mother and three of his five siblings were sold. After his own religious conversion, Richard joined the Methodist Society, began attending classes, and evangelized his friends and neighbors. Richard and his brothers attended classes every week and meetings every other Thursday. When white neighbors complained that such indulgence of "Stokeley's Negroes would soon ruin him," the brothers decided that they "would attend more faithfully to our master's business, so that it should not be said that religion made us worse servants." Their strategy proved effective; Stokeley boasted "that religion made slaves better and not worse," and granted Richard permission to "ask the preachers to come and preach at his house. When the charismatic white preacher Freeborn Garretson preached that slaveowners were "weighed in the balance, and... found wanting," Stokeley "believed himself to be one of that number, and after that he could not be satisfied to hold slaves, believing it wrong." Richard took up his master's suggestion that he purchase his freedom. He set out to earn the money by working for the Revolutionary forces, eventually taking the surname "Allen" to signify his free status. For the next six years, Allen traveled the Methodist circuit, throughout South Carolina, New York, Maryland, Delaware and Pennsylvania, preaching to black and white congregants alike. He worked as a sawyer and wagon driver when he needed to earn money. Allen walked so many miles that at times his "feet became so sore and painful that I could scarcely be able to put them to the floor." While preaching in a town near Philadelphia, Allen was asked by the Methodist elder to preach to the black congregants at St. George's Methodist Church. Allen agreed, though he was required to preach at a 5:00 a.m. so that his services would not interfere with the whites'. He also preached on the commons in areas of the city where black families lived, often preaching as many as four or five times a day. In this way he raised a society of 42 members, while he supported himself as a shoemaker. As the group grew in number, Allen "saw the necessity of erecting a place of worship for the colored people," an idea rejected by "the most respectable people of color in the city," but embraced by "three colored brethren ... the Rev. Absalom Jones, William White and Dorus Ginnings [who] united with me as soon as it became public and known." The white elder of the church, when this plan was explained to him, "used very degrading and insulting language to us, to try and prevent us from going on. We all belonged to St. George's church.... We felt ourselves much cramped; but my dear Lord was with us, and we believed, if it was his will, the work would go on, and that we would be able to succeed in building the house of the Lord." Allen and Jones continued their discussions, and in 1787 decided to form the Free African Society, a non-denominational religious mutual aid society for the black community. Eventually this society grew into the African Church of Philadelphia. Allen continued his Methodist ministry, and seven years later, in 1794, founded Bethel, which became the "Mother" church of the African Methodist Episcopal Church, the first independent black denomination. In 1793, Allen and Jones responded to Benjamin Rush's call to mobilize the black community to serve during Philadelphia's yellow fever epidemic. When reports circulated of blacks plundering and profiteering from the disease, the two ministers published A Narrative of the Proceedings of the Black People, During the Late Awful Calamity in Philadelphia in the Year 1793 and A Refutation of Some Censures Thrown upon them in some late Publications, a defense of the black community and a documentation of their heroic efforts. Despite denominational differences, Allen and Jones remained lifelong friends and collaborators. Together with James Forten, they became the acknowledged leaders of the black community. The three men figured prominently on both sides of the ongoing colonization debate. With the support of his second wife, Sara, whom he married in 1800, Richard Allen remained an ardent activist on behalf of the local and national black community. Allen died in 1831, widely revered as, in the words of abolitionist David Walker, one of "the greatest divines who has lived since the apostolic age."